The Spin: Director Coulter takes advantage of this being the last season by adding some compelling directorial flourishes, and was that a nod to Twin Peaks and Lynch in the opening “through an ear” dissonant audio-visual cross-cuts, which were bookended nicely in the end with an all-too noticeable missing ear? It’s nice to see the regular series directors give it their all, but it has me worried that Winter felt the need for such a ho-hum filler episode when the there’s only six left to go after this. This week we got (mis)treated to some bizarre sequences in a women’s sanatorium where Gillian (Gretchen) has been spending her days that played with our prurient-minded expectations, continued grim flashbacks to Nucky’s childhood, Nucky turning to Torrio to see who tried to nab him last week in Cuba, Lansky still plotting with Luciano and Siegel to up their game (at the Nuckster’s expense? ), the Muller formerly known as Van Alden still making a mess of things at home and at work (with no help from a drunk-as-a-skunk Eli), Capone getting all Capone-y (seriously his character has become a clichéd bore after some shining moments in seasons’ past), young Will Thompson vying for an Assistant DA spot, and some distracting Look, Ma, who it is! guest-appearances by Joe Kennedy Sr. (Matt Letscher) and Eliot Ness. What I Did Like: Nucky’s mysterious ear fetishist Cuban hitman is shaping up to be a key player in his maneuvers, and Coulter’s aforementioned Lynchian touches were, well, music to the ears (all bad puns intended). Wait Until Next Week: This was an all-to-familiar set-up episode, and the previews for next week hint at the return of Narcisse and some serious plot-thickening involving Kennedy. This entry was posted in Boardwalk Empire: Complete Episode Guide, Pop Culture, Television and tagged 1930's, Allen Coulter, Atlantic City, Boardwalk Empire, Boardwalk Empire Blow by Blow Episode Guide, Gangsters, Gretchen Mol, HBO, Matt Letscher, Mobsters, Prohibition, Steve Buscemi, Terence Winter, TV Series. 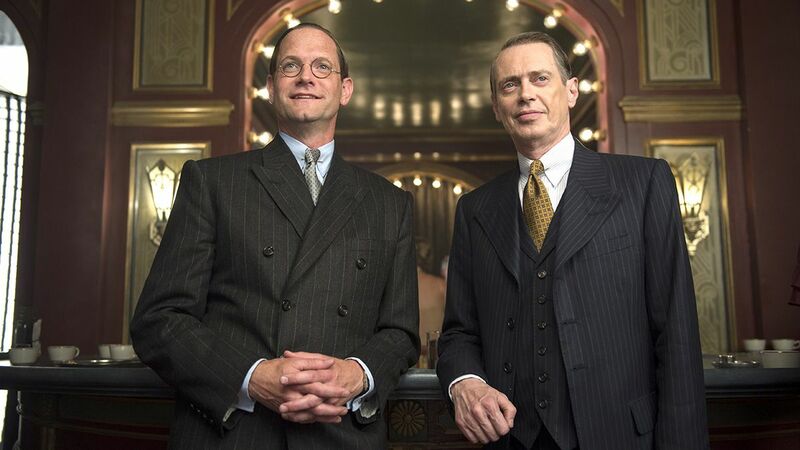 I agree Nucky’s bodyguard is the most intriguing new character this season. I also enjoyed watching the turncoat, Tonino, meet his fate, as justice for Billie Kent (who I had honestly forgotten about). By the way, after they introduced Eliot Ness, who was the man walking into the office upstairs? I recognized him but couldn’t place him. Megan – not sure who that was. I honestly had a hard time keeping track of all the characters last night. And yes, justice for Billie was great to see!